In comparison, Dr. Eli Vance wears his emotions on his sleeve. With nary a lab coat in his wardrobe, only a faded Harvard T-shirt hints Eli is a scientist, and his organized lab at Black Mesa East seems much less likely to self-destruct than Kleiner's. More importantly, "scientist" is not his sole character trait; as Alyx's father, he encourages your relationship with her while remaining fiercely protective of her in the battle against the Combine. By avoiding obvious stereotypes, Valve created a character who actually matters. Half-Life 2's other scientists, Dr. Judith Mossman and Dr. Wallace Breen, are more morally ambiguous than Gordon's heroic companions. Scientific achievement is far from Dr. Mossman's only motivation; romantic feelings for Eli lead her to cooperate with Breen in the hope that Resistance lives will be spared. Similarly, Breen genuinely believes he's helping mankind by cooperating with the Combine. His speeches warn against humanity's twin enemies, instinct and superstition, suggesting that adopting Combine technology and embracing rationalism and science is the only way to survive. With its cast of conflicting personalities and ideologies, the game offers a broad and ambiguous portrayal of what it means to be a scientist that few other games match. But while Half-Life 2 says much about scientists, it has little to say about science. That's a shame, because games have so much more to offer. 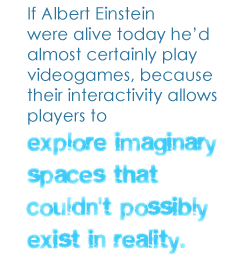 If Albert Einstein were alive today he'd almost certainly play videogames, because their interactivity allows players to explore imaginary spaces that couldn't possibly exist in reality. Einstein's famous "thought experiments" were excursions into a theoretical realm where trains race against light beams and the universe stretches like a rubber sheet, concepts crucial to developing his Theory of Relativity. It may be difficult to visualize - which is why Einstein was such a brilliant thinker - but it's easy to program into a videogame. Some developers have already done so. The science implied within the story of Braid has been widely discussed and interpreted, but less attention has been paid to the science behind the game's mechanics. Whether you see Braid as an allegory for the creation of the atomic bomb, a general warning against the dangers of pursuing forbidden knowledge or just the story of a guy named Tim searching for his Princess, it's also a crash-course in theoretical physics. "One of the core gameplay ideas behind Braid, before I even knew what the specific gameplay was going to be, was that it would involve a macro-level exploration of unintuitive phenomena, like the laws of quantum mechanics," says Jonathan Blow, the game's creator. "The idea was to focus on the incompatibilities between laws of nature and 'common sense': What would the world be like if we lived according to these rules from day to day?"